ABS Mastersmith Andrew Meers has developed a unique style that sets him apart from other bladesmiths. This sleek Integral Paring Knife provides plenty of finger clearance while being extremely dexterous. The nicely arced blade has a perfect shape for an efficient cutting. Meers hand forged the ladder pattered Damascus to shape from 1084 and 15N20 carbon steels. 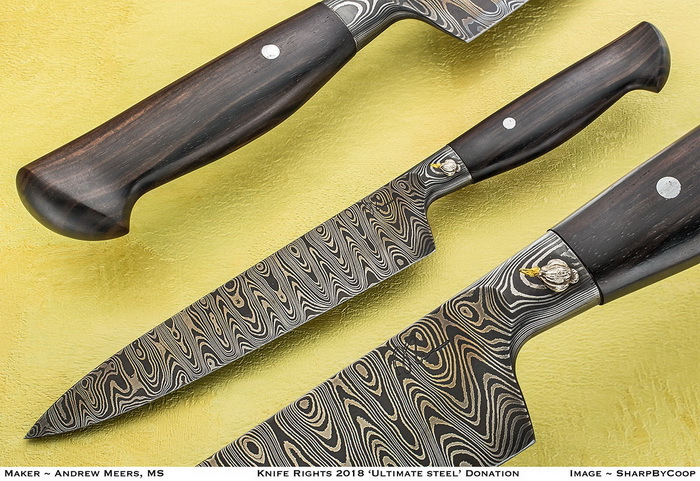 The "integral" blade and bolster are made from one solid piece of Damascus. The top of the bolster is inlaid with a silver and 24K gold onion, a signature detail. Meers formed the elegantly contoured handle from Ebony wood. Gorgeous to look at, indeed, but it is made to be used. Andrew currently lives in Philadelphia where he works as a metalsmith and master bladesmith. His work has been shown throughout the US, and he has been a resident artist at the National Ornamental Metals Museum (Memphis) and an instructor/technician at the Appalachian Center for Craft (TN). 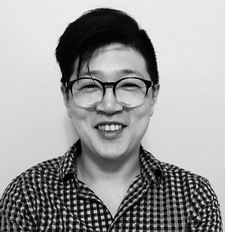 He has also taught workshops at several schools and universities including Penland. Andrew has an MFA from Southern Illinois University Carbondale and a BFA from Massachusetts College of Art and Design (Boston).